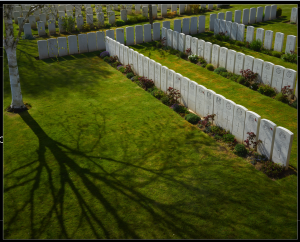 Please join us for a lecture by the award winning landscape photographer, Simon Norfolk, on the politics of remembrance after WW1, based on his forthcoming documentary series Ricochet. After the Battle of Waterloo in 1815 soldiers’ dead bodies were simply ‘shovelled into a hole and so forgotten.’ Even in the early months of the First World War the only names on casualty lists in newspapers were those of Officers. But by the war’s end in 1919 we had shifted to building hundreds of military cemeteries where every single soldier, down to the lowest Private, would be eternally remembered, in stone like a pharaoh. Elaborate ceremonies – this thing we call ‘Remembrance’ with a capital R – were manufactured to memorialise their deaths. The sheer number of dead and the brutal, industrialised meaninglessness of their dying called forth the greatest period of British cultural creativity of which you’ve never heard. This lecture (which is based series of documentary programmes) examines how that change came about and offers a hard-hitting polemic against the standard model of Remembrance that was created after the Great War. What’s wrong with pretty war cemeteries and cenotaphs and the Tomb of the Unknown Soldier? Quite a lot, this lecture argues. The lecture is a keynote address for an AHRC funded workshop, ‘Reconciliation Histories’ as part of Art&Reconciliation: Conflict, Culture and Community. The workshop explores forgotten and hidden moments of (non)reconciliation to challenge what it is that is meant be reconciliation and how it is to be achieved in the contemporary era. To this end, papers draw on diverse historical and cultural contexts, from responses to the Athenian wars, to the consequences of the reverberations of the memory of the Bolshevik revolution for Russian culture today. Whilst the workshop is principally for those presenting papers, there are a limited number of spaces left for those interested in attending. Please email henry.redwood@kcl.ac.uk for more information.